They were four exceptional soldiers, a new generation asked to save an army that had been hollowed out after Vietnam. They became the Army's most influential generals in the crucible of Iraq. Collectively, their lives tell the story of the Army over the last four decades and illuminate the path it must travel to protect the nation over the next century. The careers of this elite quartet show how the most powerful military force in the world entered a major war unprepared, and how the Army, drawing on a reservoir of talent that few thought it possessed, saved itself from crushing defeat against a ruthless, low-tech foe. 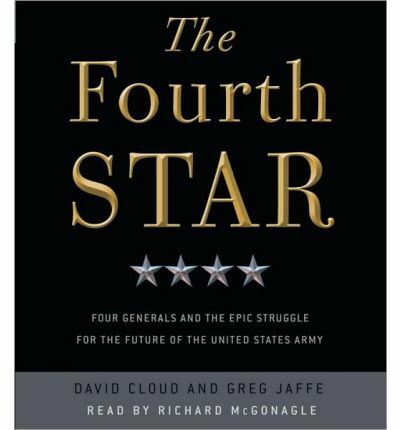 In The Fourth Star, you'll follow:H Gen. John Abizaid, one of the Army's most brilliant minds. H Gen. George Casey Jr., the son of the highest-ranking general to be killed in the Vietnam War. H Gen. Peter Chiarelli, an emotional, take-charge leader who felt the sting of the Army's failures in Iraq. H Gen. David Petraeus, a driven soldier-scholar. When he finally got his chance in Iraq, he changed the Army's conception of what was possible.The Fourth Star ranges far beyond today's battlefields, evoking the Army's tumultuous history since Vietnam through these four captivating lives. About the Author: David Cloud was the Pentagon correspondent for the New York Times from 2005 to 2007. He previously worked at the Wall Street Journal, where he covered national security and intelligence issues. Greg Jaffe is the Pentagon correspondent at the Washington Post and previously held the same position at the Wall Street Journal.